The album begins brilliantly with the song that roped me into checking it out in the first place. “Ends of the Earth” is the perfect port of embarkation. The single has this vibrant and ethereal, bouncy feeling to it that oozes big country, and the charming quality of the lyrics lends the tune a sense of the humble in the face of the grand adventure of its instrumental. With the many things going on in the music weaved perfectly into a stunning tapestry, it never feels busy, and resembles everything I love about Bon Iver’s stunning sophomore release. After putting that song on repeat a few more times, I prepared to take the record in in its entirety. What unfolds over the next nine tracks is nothing short of an art folk masterpiece. 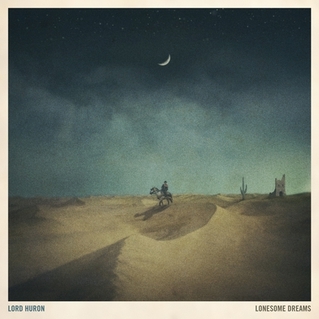 A loose concept album, all of Lonesome Dreams‘ tracks flow effortlessly from one to the other. There’s a gorgeous continuity to the record that brings a nice tug to the heart whenever a little bit of it is revisited (the melody from “The Ghost on the Shore” is later used in “The Man Who Lives Forever,” and the motif from “Ends of the Earth” is recalled masterfully at the end of the album on “In the Wind”). Laced with short, majestic instrumental breaks, sometimes in the middle of a song, Lonesome Dreams plays out almost like a film score. The second track on the album, “Time To Run” demonstrates this well. At its heart, the song is a punchy, almost rockabilly jam with a cute chorus, but it begins, ends, and is indeed interrupted with a very cinematic lull. To casual listeners, I’m sure this would irritate, but to me it adds to the experience. The title track is my favourite on the record at this point in time. The smooth and breezy nature of the vocals sells the lovesick nature of the lyrics like Billy Mays sold OxiClean. It’s a simply breathtaking song about loneliness and the journey through it while clasping just a little bit of hope in your chest. Lord Huron’s powerful gift first became apparent to me on this tune. Much like Bon Iver, the magic of the instrumentation and arrangements, and the passion of the delivery, are everything. There’s a soothing flatness to the presentation that gives the record a unified feeling, but the hooks are subtle, nearly constant, and are brilliantly placed within the arrangements. Instrumentation is quite the factor here. Lord Huron use a wide variety of instruments from very different forms of music, but bleed them out with delicious reverb so that everything has a distant and lonely sound. For instance, I’m normally quite opposed to the harmonica, but the way it is used in “The Ghost on the Shore,” it’s sweetly effective. I find the buttery smooth vocals are always clear as a bell and accompanied by a soft, reverb-soaked background layer that lends them an extreme warmth. The haunting high octave in “Ghost” brings goosebumps. With the production the way it is, the band is able to include the best elements of country, folk, world music, and even new wave in a package that sounds uniquely like all of them and none of them at the same time. “She Lit A Fire,” a beautiful little love song, is about the folkiest number on the record, and is also the best for demonstrating the band’s awesome rhythm section. The drums and bass combined deftly guide you through the charmer of a song and create a surprisingly energetic kick, similar to what “Towers” did on the aforementioned Bon Iver album. Surprisingly expressive percussion on another stellar song, “The Man Who Lives Forever,” creates a hook in its own right that is so subtle as to surely be missed, but is also something to listen for and marvel at during later listens. Another fantastic moment for me comes toward the end of the album, with “Brother,” a song with a terrific and celebratory world music sound that evokes fond memories of Peter Gabriel’s “In Your Eyes.” The percussion is once again powerful. “In the Wind” brings the album to a triumphant, smiling end, providing a nice rebuttal to the record’s frequent feelings of isolation. Its majestic string sections and touching harmonies steal the spotlight on this one. There are absolutely no dull moments on the record for me. I can press play, sit back, and take in the unbridled atmosphere with no gripes whatsoever. And when the record comes back to the beginning again, I’m usually all ‘ah hell, let’s hear it again, maybe just once more through.’ Lonesome Dreams is one of few records I can declare legitimately perfect and I simply must share it. It’s the kind of many-genre-encompassing record that is tailored to forward-thinking listeners of many genres like myself. What’s more, the superbly talented Lord Huron will be releasing their second full-length, titled Strange Trails, this coming April.